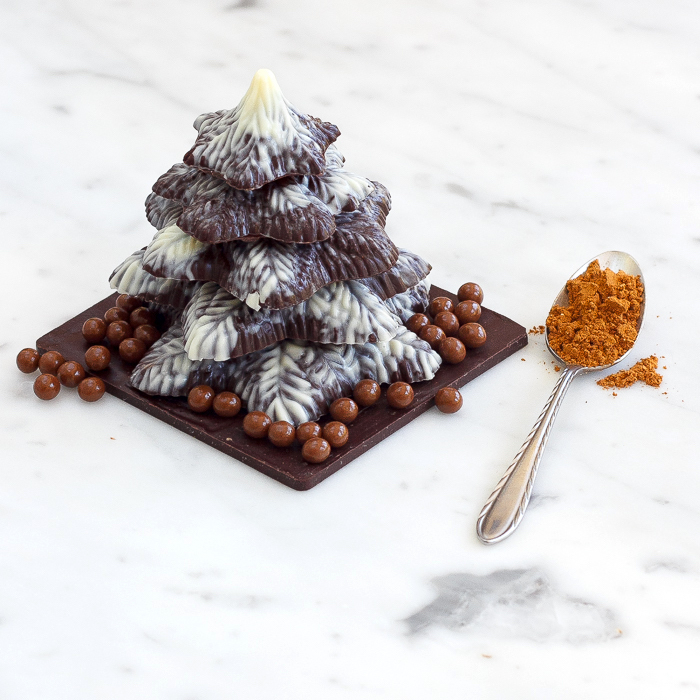 Our chocolate Christmas trees are harking back to tradition this year, with snowcapped branches and a crunchy forest floor. I've added a wonderfully aromatic gingerbread spice blend to a very special Venezuelan origin 72% dark chocolate couverture. This exceptional chocolate is my all time favourite and is not available in Australia. My special stash is limited, so these will be limited in number! A little white chocolate "snow", on top, and a few crunchy caramel milk chocolate crunchy pearls complete this delightful chocolate experience. A super delicious ending to Christmas lunch, it is just made for sharing. THIS ITEM IS TOO FRAGILE TO SHIP. IT IS AVAILABLE FOR PICK UP FROM ALPHINGTON, SOUTHBANK and MELBOURNE CBD. Ingredients: cocoa beans from Venezuela, sugar, cocoa butter, whole milk powder, gingerbread spice blend (cassia, coriander, star anise, ginger, nutmeg banda), Caramelia crunchy pearls (sugar, cocoa butter, caramel (skimmed milk, whey, sugar, butter, flavoring), biscuit cereals (wheat flour, sugar, wheat malt, wheat starch, raising agent: E500ii, salt, cocoa butter, natural flavouring) 11, 2%, whole milk powder, cocoa beans, glazing agents (maltodextrin, shellac), emulsifier (soya lecithin)), natural vanilla extract, emulsifier (soya lecithin). Allergy information: Contains gluten (wheat), milk, and soy. This product may contain traces of nuts and egg proteins. Store in a cool, dry place, between 16-18ºC. This item is fragile and only available for pick up from Chocolate Chilli Mango in Alphington or Southbank and Melbourne CBD. Please contact us to arrange pick up or delivery. Please read our Shipping page for further information.